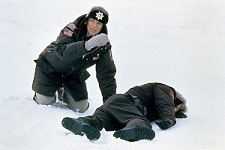 Joel and Ethan Coen’s Fargo is a refreshingly original and complexly taut film that operates on a multifaceted level that is, all at once: compelling, macabre, funny, tragic, and even romantic. From the opening sequence of a car navigating agilely through an endless snow covered road with a car in tow, the Coen brothers deftly craft a highly engaging and comically sinister contemporary masterpiece. Jerry Lundegaard (William H. Macy), a Minneapolis car salesman, arranges to meet with two petty criminals in a Fargo bar, Carl Showalter (Steve Buscemi) and Gaear Grimsrud (Peter Stormare). His plan: to have his wife kidnapped and, consequently, extort money from his wealthy, but selfish, father-in-law. His down payment for their services: a burnt umber Sierra stolen from his father-in-law’s dealership. Driving back from Minneapolis, the kidnappers are stopped by a state trooper on an empty stretch of road in Brainerd for a minor registration violation, where events begin to go horribly wrong, resulting in the death of three people. A very pregnant Chief Marge Gunderson (Frances McDormand) is called in to investigate the crime scene, and solve the murders. The pervasive theme of isolation is an essential element that is carefully woven through several aspects of the film. Note the birdseye view of Jerry returning to his car after being turned down for a loan, the upward shot of the ominous Paul Bunyan statue, and the barren winter landscape. Even a seemingly incongruous encounter with a former classmate is a portrait of alienation. The film is an exploration of the consequences of isolation: from the curious dialect of the townspeople to the desperate measures undertaken by Jerry in order to secure capital for a business venture. Fargo is a humorous, acerbic, and fascinating journey through American culture: through small-town gangsters, lounge acts, all-you-can-eat buffets…and senseless violence.